This 2,000-acre tract of lowland at canal mile 27 is in the floodplain of the Potomac. 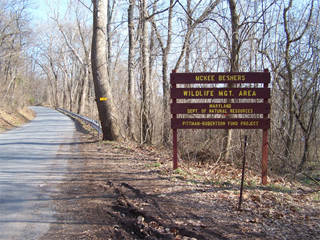 The area is managed by the Wildlife Division of the Maryland Department of Natural Resources. It is preserved primarily for a variety of wildlife species, including deer, squirrel, ducks, fox, wild turkey, quail, and dove. The operation of the area is funded by hunting license fees and taxes paid on hunting equipment. An ecosystem management approach benefits all species, so a wide variety of small mammals and birds may be found here. The mixture of field and forest dotted with swamps and small creeks provide food, cover, and water that are essential to wildlife. The fields are managed under a rotation system that provides food from crop fields, and nesting and escape cover in fallow fields. The forest is a typical river bottom forest, made up of species that like moist soil--sycamore, cottonwood, American elm, silver maple, white ash, and pin oak. The dense understory results from the rich soil deposited by the Potomac River long ago.